Another new year is here and for many of us that means a new chance to make New Year's resolutions about weight loss. This year my husband and I have started early and are trying to change our usual carb-loving (give-me-baked-good-or-give-me-death), veggie-avoiding ways. One of our biggest challenges has been not only retraining ourselves, but convincing our kids that fruits and vegetables are not only healthy, but actually really tasty too! These are some goals and guidelines we are trying to follow. Hopefully we will all ring in a successfully more healthy year in 2012! 1. Try at least one new vegetable or fruit each week. 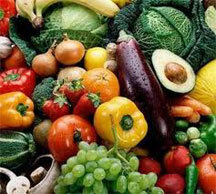 To enliven meals, switch from the old, familiar green beans, apples and bananas to okra, winter squash, papaya and kiwi. We like using the produce co-op BountifulBaskets.org. We get lots of produce for a great price and there is almost always something new, or at least, less familiar to us. It has been a fun challenge to eat new things. It turns out, we like a whole lot more than we thought we did! 2. Eat more "main dish" salads. Use a large salad as the base, but throw in meat. By adding a few ounces of cooked chicken, turkey, tuna or some low-fat cheese and/or legumes you can really make a salad a lot more filling without cutting out the produce. Add warm bread, and you've got a complete meal. Don't be afraid to take advantage of bagged salads. They can provide a much needed boost on a night when you need a quick dinner. Just dress it up with some quick add-ins and it will be delicious and fast! 3. Put fruit in your vegetables. Add sliced or chopped apples, pears, grapes, melon, kiwi and orange sections to tossed spinach and cabbage salads. You can even combine cooked vegetables with fruit. My favorite salad includes lots of greens, chicken, apples, craisins, and Parmesan. 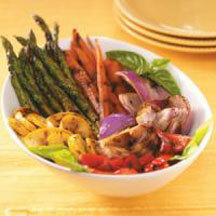 Lots of different flavors make for a yummy salad. 4. Make a point to have at least one fruit serving with each meal. It's easy. For instance, have a banana or strawberries on cereal, a piece of fresh fruit with your lunch and/or as a snack and a fruit serving with dinner. If you don't feel like cooking a vegetable or making a salad, slice up some cantaloupe or honeydew melon. 5. If you're in the dessert habit, try substituting fruit. Fruit is sweet enough to pass for dessert, but if you need a little more than plain fruit there are a million creative ways to fancy it up. Try to make this substitution at least three times a week. For instance, try an apple baked with some cinnamon and a few raisins, a banana with a small amount of reduced-fat peanut butter, even a banana split with frozen yogurt. 6. Experiment with nonfat flavorings. Sprinkle nutmeg and lemon juice on spinach or broccoli, dill week and Dijon-style mustard on green beans or carrots, and basil on tomatoes. 7. Mix your vegetables. For example, combine corn and beans, zucchini and onions, red potato and carrot slivers, eggplant and tomatoes, cucumbers and onions. Frozen mixtures without sauce are fine too. Just mix things up a bit to avoid the "same old" attitude we tend to fall in. 8. Eat more vegetable-rich main dishes. They don't all have to be "meatless" but make a point to center your entrees around the vegetables rather than a large serving of meat with vegetables as sides. For instance, you could try Eggplant Parmesan or Vegetable Pizza. 9. Combine vegetables with tasty broths and juices. Green beans cooked in chicken broth, summer squash in tomato juice, and carrots or beets in fruit juice are flavorful and need no added fat. 10. Have at least one vegetable at lunchtime. Take along ready-to-eat carrots, cucumbers and celery, or red pepper slices with fat-free salad dressing. If there's a refrigerator at work, keep these items on hand. Pre-cutting veggies can make it so much easier ad them to your meal, especially when you are working and don't have lots of time for prep. 11. Be creative with low-fat potato toppings. Try salsa, nonfat cheese, and nonfat sour cream with chives, fat-free butter spray and just a few bacon bits, fat-free salad dressings, low-fat chili or low-fat cottage cheese with dill weed. 12. Try roasting or grilling vegetables. Roasted vegetables taste heartier and more flavorful than steamed or boiled ones, and they are easy to prepare. Coat chunks of peppers, zucchini, summer squash, onions, eggplant or firm tomatoes with a light coating of vegetable spray or marinate them in a low-fat dressing, and grill or bake at 400 degree F oven for about 15 minutes, turning occasionally. The flavor is wonderful when prepared this way!